What is “lightning position,” anyway? This was the worst kind of exam: where your life might depend on remembering the material. Since I was lucky, I checked my answers against credible sources afterwards. Something I did right: The Park rangers knew the location of my fieldwork for the day, and my housemate knew to expect me home by 5pm. ALWAYS tell someone where you are going and when you should return. I could have been more organized about leaving a map and the phone number of the rangers for my housemate. A good place to see storms coming, but not a good place to wait for them to hit. I was out there removing nails and string that had marked my old study plots, now that the data was collected and the paper written. I had only a few more to go when I straightened up to look out at the view (it is a pretty beautiful site), and noticed the thunderstorm was, in fact, headed my way. Wind patterns can be unpredictable, and I have seen storms pass by miles away many times, so I waited until I saw lightning on the next set of hills, about 6-10 miles away, before realizing I might really get wet. Fortunately, I had only three more plots to go, so I hurried to jam the last of the materials in my backpack, then turned towards my car. Something I did wrong: I should have just left much sooner. It turns out you are so much safer in a car or modern building (not a bicycle or tent) that that option trumps anything you can do to minimize your chances of being hurt if caught out in the open. 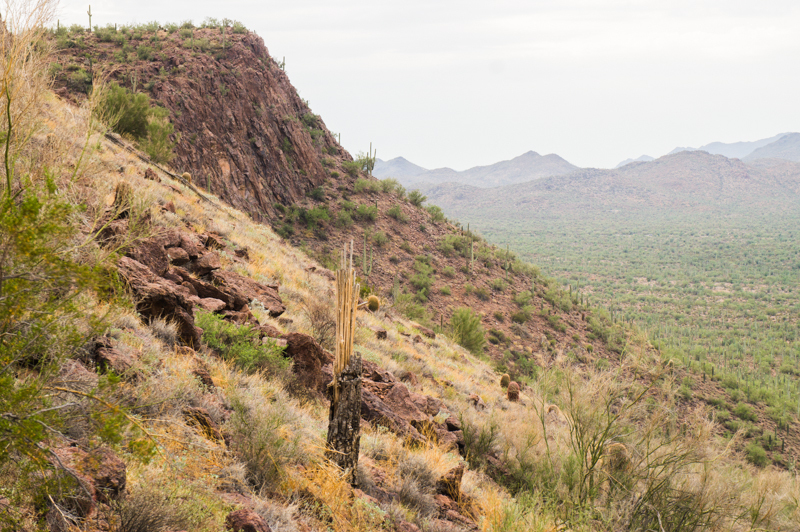 Two roads diverged in a saguaro wood and I… I took the one less survived by. I’m glad it made no difference. The first raindrops fell as I reached the bottom of the hill. My phone was already in a waterproof case, but I had forgotten a larger waterproof bag for my camera, so I wrapped it inside my hat, stuffed that inside my backpack, and hiked faster. The thunder was rumbling closer, and I was glad I had only flat desert and washes in the 1.75 miles left between me and my car. Then the first ground strike hit between me and my car. I can only describe the shocked feeling I had as having been cheated or betrayed by the desert. I was supposed to be safe once I was off that hill! What was the lightning doing, hitting the low desert? Counting the seconds (“one-one-thousand, two-one-thousand…”), I guessed it was about a mile and a half away. The storm was sweeping toward me from my shelter, and I had nowhere to run. I stopped and crouched down, then checked my watch, thinking that if no more lightning hit for fifteen minutes, I would keep moving in that direction. Something I did right: It might be that crouching down doesn’t do much to minimize your chances of being hit. 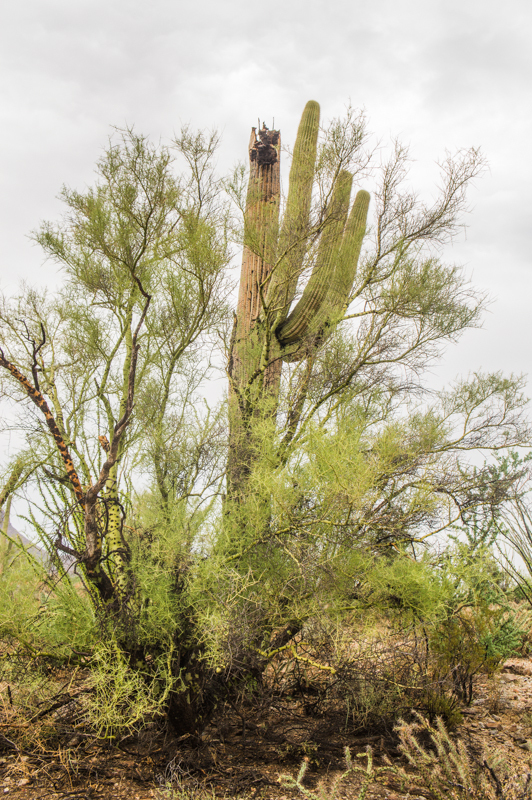 I was in the middle of a forest of 20 foot tall saguaro cactus – me going from five feet tall to three feet tall was unlikely to do much good. But it doesn’t hurt, especially as even shrubs in the desert can be hit, as long as you minimize your contact with the ground, and keep your feet together. Read on for why those are important. 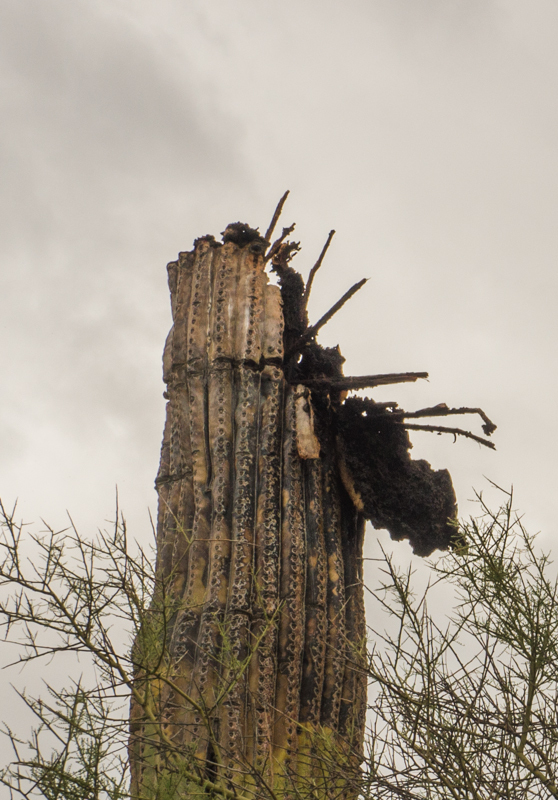 Another ground strike burned a bright connection between clouds and the green haze of the rainy saguaro forest in front of me. I counted until I heard the thunder. This one was a little closer. I checked my watch. Barely a minute had passed since the first ground strike. I thought about all the nails in my backpack. I couldn’t remember if having metal on me would make me a more likely ground leader. I took the backpack off and moved about twenty feet away, still crouching. Something I did kind of wrong, but kind of okay: The sources I looked at said having metal hiking poles or electronics will not make a big enough difference in conductivity to make you an attractive ground leader. If you have a backpack that is full of something other than metal nails, it even makes a good insulator between you and the ground in the event of ground current. Up to half of lightning fatalities are caused by ground current – electricity spreading through the ground up to 50 or 60 feet away from the strike. The more insulation between you and the ground, the better. Sit on top of a backpack or crouch sleeping pad if you have one. I say I did it kind of okay because I took it off for the wrong reason, and didn’t think to empty out the nails and get on top of it, but I was more comfortable without the weight on my shoulders, and there wasn’t much in there to really insulate me. I started going through a checklist of everything I could remember from outdoors leadership trainings on lightning safety. 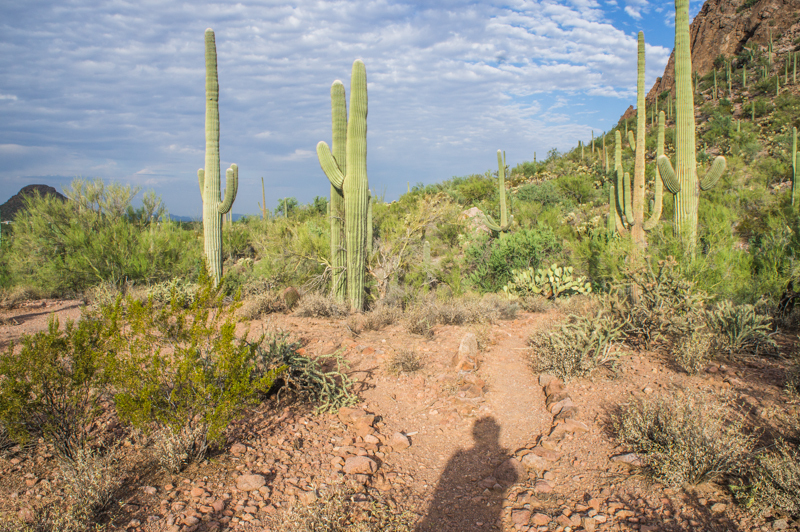 I still felt terribly exposed on the open, flat ground between the low shrubs and saguaros. Shallow washes ran parallel to me, the nearest one about 100 feet away. I ran to it, and down the bank. I crouched on the side of the wash, not down in the bottom where water could pool and run, but still lower than the flat ground surrounding the wash. 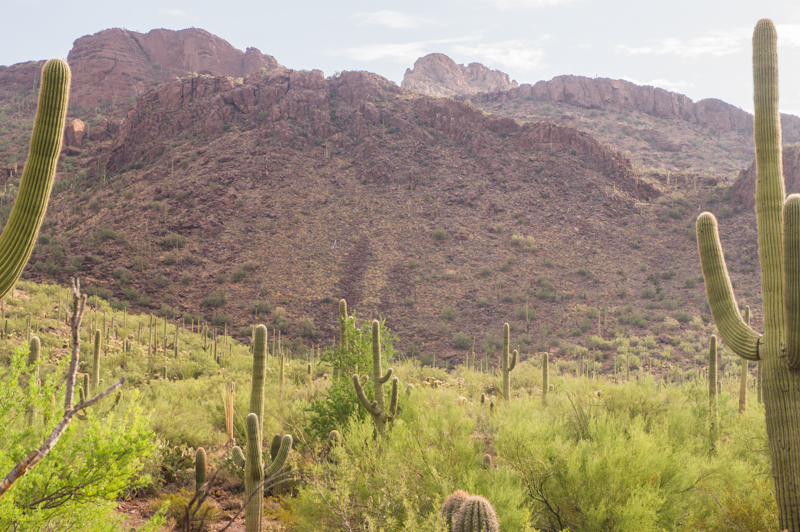 I made sure I was at least 30 feet from all the saguaros and other tall plants. Something I did right: Getting into depressions or washes is better than being on flat ground. NOAA says that probably does more to decrease your chances of being hit or taking ground current than just crouching down. However, water conducts electricity very well. Current could spread much further through water than solid ground, so make sure to stay out of any water in the wash. Also avoid holding on to wet ropes, metal railings and fences, and other long conductors. Something else I did right: You probably know not to stand next to a tall tree (or cactus) in a lightning storm, because the current could arc out sideways (called side flash) and through you. There is less good data on how far away that arc could travel even than on how far ground current travels, but 30 feet away is probably safe. Stay crouched in a small ball away from tall trees to decrease your chances of side flash. Ground strikes continued to hit the flat ground within two miles of me every one to three minutes for the next twenty minutes. I kept good track of that time, even though I stopped counting the strikes. Some were simultaneous sound and light, so I guess less than a quarter mile away. Some were long; the bolt burned white for what seemed like nearly a full second. I remember being surprised my ears were not ringing from those, but probably I wouldn’t have noticed them ringing over the constant grumbles overhead and the racket of the pouring rain on desert stone. This is the flat desert between the hillside and me. I was closer to those hills when the lightning was striking around me. Bolts were hitting near where this photo had just been taken just hours before. Have you ever tried to hold a crouch on your toes for twenty minutes straight? It’s really hard on your leg muscles. Mine were burning. I tried to shift positions, but I thought I remembered something about it being safer to have your feet or ankles touching, which limited the number of positions I could really get into. Something I did right: Here is where I really suggest checking out the NOAA guide for their silly farmer and cow diagrams. Remember how I said up to half of lightning fatalities are caused by ground current? If your feet are together, the difference in voltage between your feet – leading current up through your body – is negligible. If your feet are apart, that difference in voltage can be fatal. This may have been one of the actions I took that improved my chances the most. And after twenty minutes, the ground strikes retreated to the ridges. And ten minutes later (thirty minutes after the first ground strike between my car and me), I checked my watch, as I continued to do with every strike, and another one never hit. During the fifteen minutes I decided to wait until moving from my wash, from an abundance of caution, the rain stopped, then the rumbling overhead, then the sun came out. By the time fifteen minutes was up and I was walking, blue sky was visible overhead. I was shivering, but not cold enough that I had ever really worried about the hypothermia being more dangerous than the lightning. Was this a lightning strike? In the end, I probably just survived through luck, because no bolts hit close enough for ground current to affect me. But I minimized my chances of getting hurt should one strike close by getting down in a wash, away from tall saguaro, and squatting in a tight ball with my feet touching. If I had continued to run for my car, my path would have taken me near tall saguaros and eventually fences, with my feet apart as I ran. I guess, given that I had made the mistake of staying out too long in the first place, I made the right choice in getting down rather than continuing to move. Summary: If you are outside and see or hear lightning coming…. If you can reach a car or modern building, go. If you are leading a hike, fieldwork, or some other trip, be vigilant and ready to turn back early if you hear thunder. Don’t get into a situation where you are playing your chances with lightning. In the event that you are inevitably trapped an hour or more from your shelter, find a wash or depression. If you have a group, spread people out 20 feet apart so that not everyone gets hurt from the same event, and someone is still available to help evacuate, perform CPR, and call for help if a group member is injured. Stay 30 feet away from tall objects, and stay out of water. Get into “lightning position”: Squat down in a ball, keeping your feet together, on a backpack or sleeping pad. Do NOT lie down or otherwise increase your contact with the ground. Wait ten minutes after the last strike with a ten second count between strike and thunder (about two miles) before moving out of your position. Check out the resources from the NOLS pamphlet and blog and from NOAA for more detailed data and recommendations.